This Teach Tuesday post contains some affiliate links. With a purchase from these links a small commission can be made, which helps keep this blog running. It’s teach Tuesday!!! 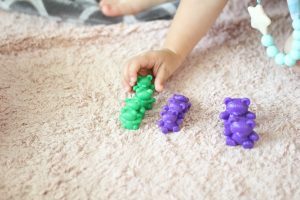 I’m sharing a few ways to use counting bears when working on math skills. I like learning to be fun, especially math! Here are some fun activities with counting bears. 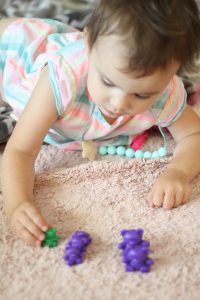 Working on simple 1 to 1 correspondence is very impart for early math skills. So your kid can count to 10, good. Do they know the meaning or what they are even saying? Example 1: Line 10 bears up for your child. Say, “Let’s count together.” or “How many bears are there?” Model by pointing to each bear as you count. Ask them to point to each bear (or use hand over hand). Hand over hand is holding their hand to guide them, so you would be guiding them to point to each each as you count. Patterns need to be sorted by you. Did you know a pattern needs to be repeated 3 times minimum for the child to really comprehend it? Start with an AB pattern. Example 1: “Let’s make a pattern. Red, blue, red, blue, red, blue. What comes next?” If they don’t get it, model it, “it’s the red one!” Repeat the pattern again and ask ashen what comes next. Once they have mastered a simple AB pattern you can add in others. Example 1. ABB: “Let’s make a pattern! Red, blue, blue, red, blue, blue, red, blue, blue. What comes next?” If they don’t get it, model it, “it’s the red one!” Repeat the pattern again and ask what comes next. 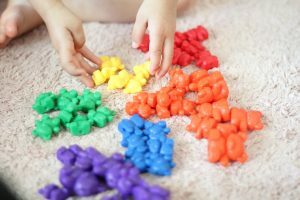 When sorting you need to start simple for your child and build up to more complex thinking. For example you will start talking about 1 difference. They mastered this kind of sorting? Now you can step it up a notch. Add in two differences. You can add more and more as they master each level of sorting. 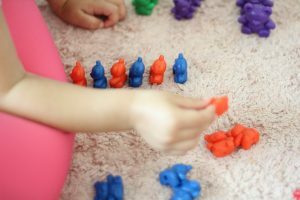 Example 1: “Look for the big purple bears and the little purple bears.” Model putting them in different piles for your child to see. They are now searching through the bears for sizes and colors. What a fun and unique way to learn to count! Such a cute idea! Isa has been into patterns lately. She’s really good! Great idea just like always! I’m going to try something similar with my youngest!